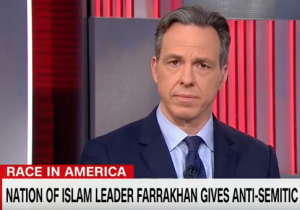 CNN's "The Lead" host Jake Tapper called out some on the left for wanting to glean any positive impacts of a relationship with Nation of Islam leader Louis Farrakhan but not being willing to face any backlash. Tapper began the segment on Monday by playing a clip of Farrakhan's recet anti-semitic, homophobic speech in Chicago. "Jews were responsible for all of this filth and degenerate behavior that Hollywood is putting out, turning men into women and women into men," Farrakhan said. The CNN host noted that "despite the anti-semitism and homophobia inherent in that clip," several leaders of Women's March and members of the Congressional Black Caucus (CBC) have refused to denounce Farrakhan, despite having previously voiced their support for him. Tapper specifically mentioned Rep. Danny Davis (D., Ill.), who told the Daily Caller earlier in February that Farrakhan is an "outstanding human being." "I don't regard Louis Farrakhan as an aberration or anything; I regard him as an outstanding human being who commands a following of individuals who are learned and articulate. And he plays a big role in the lives of thousands and thousands and thousands and thousands of people," Davis said at the time. The Illinois Democrat doubled down on those comments over the weekend, saying he "knows" Farrakhan and the "world is so much bigger than Farrakhan and the Jewish question." "I know Farrakhan, been knowing him for years and years and years and years and years, and every once in a while some writer or somebody will I guess try to think of something to say about Farrakhan, but nah, my world is so much bigger than any of that," Davis said. "I don’t have time for that. I deal with it, you know, when it comes but nah, that’s not a real part of my focus." "That’s just one segment of what goes on in our world. The world is so much bigger than Farrakhan and the Jewish question and his position on that and so forth. For those heavy into it, that’s their thing, but it ain’t my thing," he added. Tapper addressed the response to Farrakhan by asking why it is difficult to "condemn a rabid anti-semite." "Why is it so tough for some people to condemn a rabid anti-semite who is also a misogynist and anti-LGBTQ?" Tapper asked. Jen Psaki, who served as a spokeswoman for the State Department during the Obama administration, said "it should not be" tough for people to condemn the rhetoric before she then attempted to explain it being a result of the divisions in the political world. "Why can't people criticize it? Past relationships, their own caucuses and constituencies sometimes play, but it's still hard to understand," Psaki said. Tapper mentioned reporting from last month about Rep. Keith Ellison (D., Minn.), deputy chairman of the Democratic National Committee (DNC), attending a private dinner in 2013 with the CBC and Farrakhan. "People want to have the association, but they don't want to get dinged for it publicly," Tapper said.